Lewis's next and final lap was better and indeed he just beat Nico's mark with a 1m 40.617, his best of the session by contrast. Nico back down the road set a first and second sectors very close to Lewis's, but when he cut the beam at the lap's end it brought gasps - a 1m 40.237, close to four tenths under his team mate's best. Or a country mile, if you prefer. Nico's final sector was stunning. As noted in the preview for this round as well this round was to be, for a few reasons, the toughest test of the 'new' Nico so far. Well as things stand he's passing it with flying colours. He also, as Nico seized upon many opportunities to remind us earlier in the weekend, is doing it with an engine with more than double the mileage of Lewis's too. Niki Lauda, as ever cutting to the chase, said Nico's final lap was "unbelievable, really quick, and nothing more to say". There was indeed nothing more to be said. And as Martin Brundle mused afterwards, "Lewis will wonder what he has to do to get on top". He's been beaten by team mates before of course but he's not used to being beaten, so far as we can tell, on raw pace like this or this consistently. For all the theories mentioned surrounding the recent way of it we can feel safe to conclude that at least one of them is a red herring, that of Lewis not being bothered now that the 2015 title is all his. Lewis gives no outward impression of not being bothered by this. And not being bothered by being beaten is not at all Lewis. He might have confirmed this too, rather conversely, by sneaking mention into his post-quali press conference that the championship remains the thing. As for Nico, for about the first time since his run started he looked almost habituated to his towering form afterwards. Like he feels he belongs now. 'Another pole? Meh'. "I'm quicker at the moment" he said, almost without emotion. "I'm very pleased about that and enjoying the moment and happy to be on pole again." Once again too he played the question over what it is he's discovered lately with a dead bat. "It's not a revival, I haven't reinvented anything" he insisted. "It's just progress and that's it. Before it was always very, very close but Lewis had that one-tenth edge and at the moment it's me that has the one-tenth edge. Today a bit more but it was very close lately in the last two races. That's it." He did also, again not for the first time, just about concede that this late form might help him when it really counts in early 2016. "Of course it's great to finish the season on a high now and then yeah, I'll be motivated to start next year in a way that this year has finished. That would be great. Unfortunately it's not as simple as that but, as always, I'll push and try and begin strongly next year." Lewis meanwhile continued to talk about frustration with his handling, and said it might have been made worse by the attempts to sort it. "I've generally been struggling with the car a bit all weekend" he said. 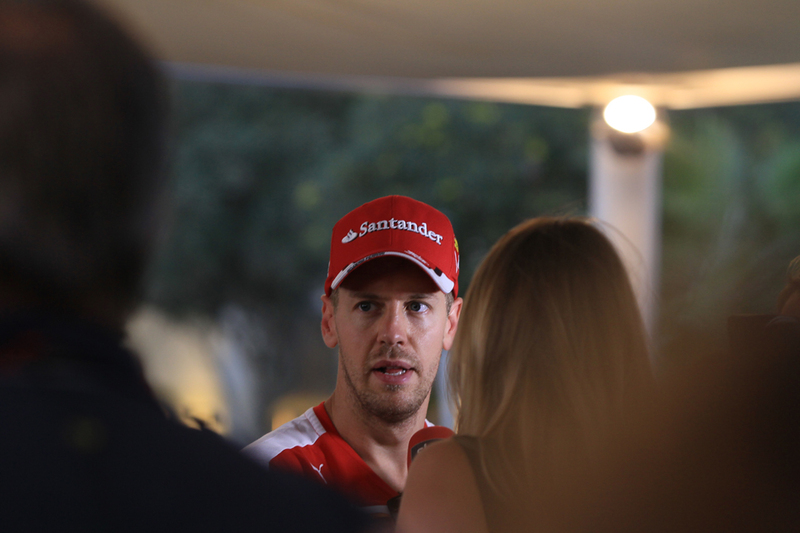 "But we've been working really hard to make some changes; we've had to take something off the car". He did pay tribute to the guy across the garage though. "Nico was just really quick today and he did a great job in Q3." Lewis also thought things might get slightly better for him tomorrow. "Generally it gets a little bit better in the race but it's [the handling problems] been for a while now. Generally just struggling on the edge with the car. It was a lot more comfortable at the beginning of the year for me and as I said, coming into this weekend I tried to make some changes. It disadvantaged myself a little bit maybe with one of the things I took off the car which was of benefit. I tried to get around it but at the end of the day it wasn't good enough." 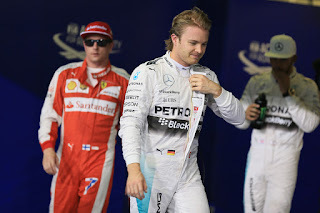 It always was likely to be an exclusive Mercedes fight for pole here and this became a certainty when its usual closest challenger Sebastian Vettel dropped out, astonishingly, in Q1. He aborted his final run, and in the blink of an eye it seemed his name was in the timing screens' 'drop zone', when no one thought him in much danger. It looked initially as if his slowing might be down to a car failure but it transpired that Ferrari had simply miscalculated what the safe 'cut off' time would be. "We misjudged it and unfortunately we went out. We did a small mistake with big consequences" explained Seb. Even so Vettel was some four tenths off team mate Kimi Raikkonen after their first runs (unusually) on the soft tyre, which indeed allowed Kimi to sit in the pits at the point that Ferrari was getting it very wrong. Seb however, demonstrating the formidable maturity that has been a feature of 2015, eschewed any opportunity to finger-point at his colleagues. Kimi had a relatively happy time of it today by his own 2015 standards. As intimated he's saved a set of supersofts from not using a set in Q1 and his lap to get through on the softs was arguably the best of anyone all day - well before the very end of proceedings at least. In the end he scored the maximum result he could have hoped for by bagging third. 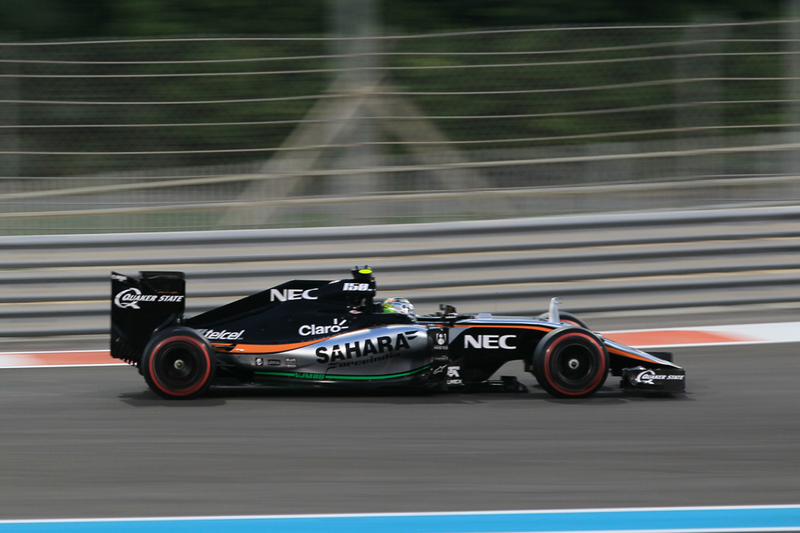 It looked for a lot of the session that he might not even get that as often it was Sergio Perez the next up. That might seem like a surprise but really shouldn't have been. 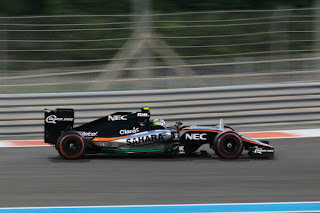 Force India has a good record here with its slippery chassis pushed along by a Merc unit often flying down the Yas Marina track's long straights. And Checo like Nico is one that seems to have found something from somewhere recently in terms of delivering consistent speed in a way only witnessed patchily before. He took fourth on the grid, and spoke afterwards of "a very strong qualifying" and that he'd "outqualified the car place by a couple of places", after a "very deep analysis" of why they underperformed in Brazil last time out. He also was "confident that we're going to take the most out of tomorrow", despite what he called quite poor tyre degradation and that it might be hard to keep the ordinarily quicker cars behind. Daniel Ricciardo was next up, and was by contrast optimistic of his ability to take it further tomorrow given the Red Bull couldn't live with the cranked up Mercs and Ferraris on the long straights in quali spec. Valtteri Bottas starts sixth, which given he only has a point over his countryman Raikkonen in the table will be something of a concern for him. As for the very front, just as was the case in Brazil the hinges of the Merc fight can be identified in advance with reasonable confidence. 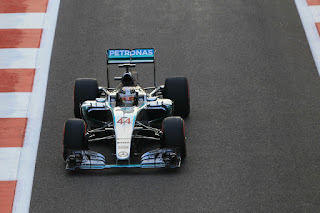 If such a thing is possible, overtaking will be even less of a goer than it was around Interlagos - "it is tough, because while you have the DRS down the back straight you can't follow through turns two and three..." said Lewis looking ahead to tomorrow's race - while Mercedes has confirmed that it's not budging from its strategy approach seen last time out of not letting the two drivers diverge much. A lot will therefore depend on who leads into the first turn. 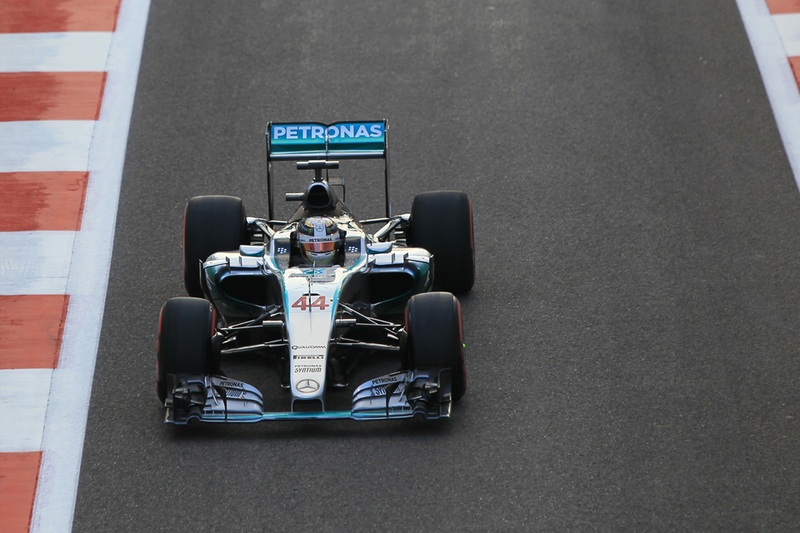 "I'm going to try as hard as I can to get a good start" Lewis added, pointedly. But all is not yet lost for Lewis or anyone else, as last year here the supersoft tyres that the front-runners qualified on had to be ditched as soon as humanely possible (and indeed something like this happened in the GP2 race after quali today too) while Merc signposted it plans to not run on that compound much tomorrow by using that tyre from the off in today's qualifying session. This should bring those further back and able to start on the softs into the picture. Last year indeed helped in part by this Ricciardo rose to finish fourth after starting from the pits, and we know that Seb also has a previous from rising from the back at this track. "We have a quick car. Tomorrow is a long race and I'm looking forward to a lot of overtaking" he promised. It's unlikely that either Mercedes driver can say the same. Though, in keeping with another recent trend, this looks once again like very good news for Nico Rosberg.